Not all tacos are created equal, however. If you have never had the pleasure of living either on the West Coast or in the Southwest (or better yet in Mexico!) you may not understand what all the fuss is about. Personally, my current passion for tacos wasn’t fanned into flame until my college days in Los Angeles. Food trucks in LA are unbelievably popular and diverse. Just about anything you could possibly want to put in your mouth is served out of a truck on any given street corner of the city of angels. Kogi, a traveling Korean/Mexican joint, is credited as the original upscale taco truck and sparked the trend of movable feasts tweeting their location. Needless to say, the romance of the chase caused a nightly migration of literally thousands of taco-craving followers. You can now find migratory, tweeting trucks in just about every major city from Seattle to New Orleans. If you think about it, even the word taco is delicious. Open your mouth and say “Ah” and then slowing close it into an “Oh” of pleasure. Nearly a year ago, back in Seattle I attempted to explain the cult of taco trucks to a British friend of ours. Simply nothing would do but have him experience the real thing at the proper visiting hour of 1am. He was an instant convert. To this day listening to Alex say the word “taak-ho” in his perfect, London prep school voice sends me into chortling fits (yes, Larney, we still have the recording). What sets really delicious, habit-inducing tacos apart is fresh ingredients. Here in Texas, I have already sworn my allegiance to Tacodeli for just that reason. Austin being a bit of a drive, however, we satisfy our taco craving at home several times a week. Again, it’s all about being cheap and fast. 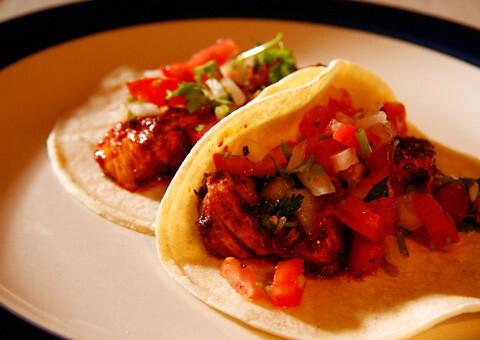 Last night I whipped together these simple, scrumptious fish tacos in about 10 minutes. The salsa fresca is a must in any form, but if you have peaches or mangoes on hand add those too. You won’t regret it. The beauty of these tacos is that they can be made with any kind of seafood, though I do recommend sticking with white fish. We used mahi mahi and it was outstanding. Do be sure to buy the freshest ingredients possible, as this will be the determining factor between good tacos and licking your wrist, the plate, and the pan tacos. I have left off measurements for the dredge in favor of ratios so you can scale it according to the type and amount of seafood you have. 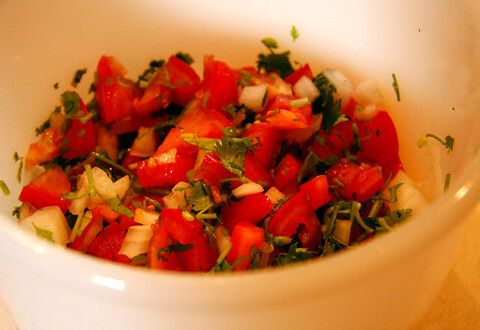 Combine all ingredients for the salsa in a serving bowl and toss well. Taste and adjust seasoning if necessary. Set aside. Mix the wet and dry dredging ingredients separately in two bowls. Toss the fish in the wet first, making sure to cover evenly. One piece at a time, roll quickly through the spices until the fish is evenly dusted on all sides. 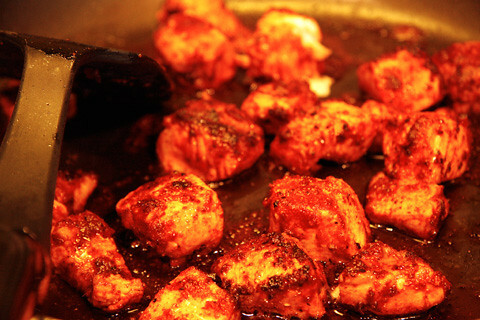 Heat the oil in a non-stick skillet on medium-high until very hot. Sear the fish rapidly on all sides (only a few minutes total) and remove from heat. Heat the tortillas until warm and pliable (we do this directly on our gas burners, but a skillet works as well). Transfer to plates, scoop in a few pieces of fish, top with salsa and enjoy! The Taaaaaaaaco truck! Yup, I’ve still got that recording, hehehe! It’s pretty belligerent now I listen to it again. I think Laugharny got a bit fed up with having to say “taco” over and over again to a car full of tipsy girls.